SPACEPORT NEWS March 23, 2007 Page 2 Awards IN THE Space Station Processing Facility, Russ Romanella (right), director of International Space Station and Spacecraft Processing, presides over a ceremony to unveil the new name of NASAs Node 2 module, Harmony. With him are mission STS-120 Commander Pam Melroy and Pilot George Zamka.Students in Harmony in naming space station module U.S. Armys Golden Knights to appear at World Space Expo T he World Space Expo set for November 3-11 at the Kennedy Space Center Visitor Complex will include a weekend aerial salute by the U.S. Army parachute teams Golden Knights as part of a 45th anniversary tribute to Project Mercury. The Mercury program successfully launched six of the original Mercury 7 astronauts into space, including Alan Shepard, the first American in space, and John Glenn, the first American to orbit Earth. The 920th Rescue Wing based at Patrick Air Force Base will also stage a demonstration as part of the tribute. The wing, formerly the 301st Rescue Squadron, was responsible for recovering the Mercury capsules when they splashed down in the Atlantic Ocean. We could not think of a better way to open the World Space Expo aerial salute than with a tribute to the brave men who pioneered Americas manned space program, said Daniel LeBlanc, chief operating officer of Kennedy Space Center Visitor Complex, host of the World Space Expo. The U.S. Army played a key role in the success of Project Mercury, using its Redstone vehicle as a launch platform. It is a privilege to perform over the Kennedy Space Center while paying tribute to the 45th anniversary of Project Mercury, said Sgt. 1st Class Karen Morrison of Golden Knights Operations.THE U.S. Armys Golden Knights parachute team will perform at the opening of the Nov. 3-11 World Space Expo. The salute will pay tribute to the 45th anniversary of Project Mercury.By Linda Herridge Staff Writer F rom the incredible minds of children came the new name of NASAs Node 2 module, which was announced during an unveiling ceremony on March 15 at Kennedy Space Centers Space Station Processing Facility. Russ Romanella, along with mission STS-120 Commander Pam Melroy and Pilot George Zamka, revealed the modules new name: Harmony. It is the first U.S. piece of the station named by people outside of the agency. Also attending the event were Bill Gerstenmaier, associate administrator for Space Operations, and astronaut Mike Baker, a veteran of four space flights. Its an exciting time in the history of human exploration, with the recent incredible assembly activities onboard the station, as well as preparations for future station missions happening here in this facility, said Romanella, who is director of International Space Station and Spacecraft Processing. The node received its new name through the NASA Exploring Space Challenges program geared at kindergarten through 12th grade students nationwide. The Node 2 Challenge, held in the fall of 2006, required students to learn about the space station, build a scale model of Node 2 and write an essay explaining their chosen name. Involving the youth of our nation in our space program is important, Melroy said. It will be an exciting moment when the STS120 crew opens the module in space. Entries came from 32 states and one U.S. Department of Defense school in Japan. The 62 entries involved more than 3,000 students across all grade levels. The most suggested name was submitted by six different schools and was selected because it symbolizes the spirit of international cooperation embodied by the station as a whole. The winning entries for Harmony came from World Group Home School in Monona, Wis.; a ninth grade class from Lubbock High School in Texas; third grade classes from Buchanan Elementary School in Baton Rouge, La., and West Navarre Intermediate School in Navarre, Fla.; and eighth grade classes from League City Intermediate School in League City, Texas, and Browne Academy in Alexandria, Va. Harmony will be delivered to the station on mission STS-120, scheduled for later this year. It is the second of three nodes that will serve as connectors on the station. During the mission, Harmony will be attached to the front of the U.S. Lab Destiny. Both the European Space Agency Columbus module and the Japan Aerospace Exploration Agency Kibo research module will use connecting ports on Harmony. In an agreement between NASA and ESA, the node was built by Alenia Spazio at its facility in Torino, Italy. Harmony weighs approximately 30,000 pounds and is about 24 feet in length and 15 feet in diameter. According to Romanella, it is presently the heaviest element for delivery to the station. SPACEPORT NEWS Page 3 March 23, 2007 Hanson receives woman engineer award ROSELLE HANSON was named the 2007 Outstanding Woman Engineer of the Year by the Society of Women Engineers Space Coast Chapter. By Jennifer Wolfinger Staff Writer R oselle Hanson, the Engineering Directorates deputy director for management, was recently selected as the Outstanding Woman Engineer of the Year by the Society of Women Engineers Space Coast Chapter. She was recognized for her sustained excellence, outstanding leadership and personal integrity that exemplifies and promotes the goals of the society. I was very surprised and honored to be selected. I was nominated about 10 years ago in another category and, from that experience, I knew the other nominees would be highly talented, respected and have outstanding credentials, said Hanson. I did not expect to win; it truly was a surprise. In her position, she is responsible for the business, work force and personnel aspects of the Engineering Directorate. She works with all of the directorates divisions and offices to maintain According to Hanson, the directorate works closely with the Launch Services Program, Launch Vehicle Processing, International Space Station and Spacecraft Processing, and Constellation Ground Operations organizations. I have been very fortunate to have had opportunities to work in many directorates here at Kennedy Space Center and at NASA Headquarters and Johnson Space Center, and to have led several high-performing teams, she explained. I love the work we do at NASA and the people  our NASA and contractor work force  are the best. I believe in mentoring individuals and helping them see opportunities to learn and grow. Award nominees must demonstrate a high level of competence, leadership and personal integrity in their job; contribute personally to their organizations mission; have developed, or be developing, their own potential in the engineering profession or outside activities and have helped other the skills and work force required to meet NASAs needs on time and on budget. women engineers develop their potential. Nominees also must have worked for and significantly contributed to the enhancement of womens status on the job or in the community; have at least seven cumulative years of engineering experience; and reside or work in Brevard, Volusia or Indian River counties. Hanson graduated from Corbin High School in her hometown of Corbin, Ky. She received an associates degree in civil engineering technology from the University of Kentucky. Later, she earned a Bachelor of Science degree in electrical engineering and a Master of Science in industrial engineering and management systems from the University of Central Florida. Her husband, Dave, teaches and coaches at Astronaut High School in Titusville. They enjoy being active in their church and have two adult children, Eric and Jill. For information about the society, visit http://www.swesc.org Willcoxon to lead Launch Vehicle Processing RITA WILLCOXON is director of the Launch Vehicle Processing Directorate. She is the first woman to hold that position at Kennedy.By Linda Herridge Staff Writer W hen Rita Willcoxon became director of the Launch Vehicle Processing Directorate at Kennedy Space Center in January, she became the first woman in the history of the space program to hold that position. Her responsibilities include overseeing the processing of three orbiter vehicles and integrating and launching the Space Transportation System missions. She is also responsible for the transition and retirement of shuttle assets as the program concludes. She has recently been tasked by Tip Talone, the KSC Constellation Project Office director, to assist in planning and ultimately performing the launch vehicle and integrated processing of the Constellation system. Her team is already heavily engaged in activities leading to the planned 2009 launch of the Ares 1-X test flight. The challenge for the organization is in balancing all three of these very important KSC roles  Willcoxon said. She said the biggest challenge will be to safely fly four to five shuttle launches per year in order to complete the International Space Station before the end of the program in 2010, while gearing up for the new Constellation Program at the same time. Our primary near-term challenge in Constellation is to complete the ground support system modifications to prepare for the Ares I-X test flight. This work will be added to the existing Space Program Operations Contract in which Willcoxon has technical management representative responsibility. I am enjoying my new role, Willcoxon said. Ive had different challenges in my career, but this is the most challenging. The Launch Vehicle Processing organization has a very exciting future and I am grateful to be a part of it. She said former Shuttle Processing Director Mike Wetmore helped to prepare her for the new role. And Im surrounded by a great group of highly motivated people who are passionate and dedicated to their work. Willcoxon said she is grateful for the expertise of NASA Space Shuttle Program Manager Wayne Hale. Hes there to make sure everything we do is integrated across the agency and he asks the hard questions, she said. Willcoxon has worked at KSC for 19 years, but has 25 years of government service. Prior to her new position, she served as deputy director of Shuttle Processing. Previous positions included acting director and deputy director of the Spaceport Engineering and Technology Directorate. Page 5 SPACEPORT NEWS March 23, 2007 ne dy Space Center All-American Picnic rk 1 included an expanded menu selection. fo r a day outdoors. s ( left) presents Rocco Russo, owner of a red, th e trophy for Center Directors Choice. CATHY HESTERS 2002 Victory Drifter, which features the space station on the gas tank and a space shuttle on the back fender, won Motorcycle Best of Show. THE TUSKEGEE Airmen talked about their personal experiences and signed autographs during the AllAmerican Picnic. Other exhibits included the Disability Awareness and Action Working Group, KSC Barracudas Dive Club, KSC Fitness Centers, KSC Amateur Astronomers, US Fish and Wildlife Service and more. THE CHILDREN at this years picnic enjoyed a variety of games and treats. At left, Ashley Campbell gets her face painted by Shani Pehl. Nineteen childrens games were part of the Childrens Carnival. DENNIS MCDONOUGH won Truck Best of Show for his custom pickup. Page 6 SPACEPORT NEWS March 23, 2007 Kennedy co-hosts FIRST robotics regional contest By Jeff Stuckey Editor H igh school students from throughout Florida, seven other states and Puerto Rico packed the University of Central Florida Arena March 8-10 to compete in the 2007 Florida FIRST Regional Robotics Competition. NASAs Kennedy Space Center and the UCF College of Engineering and Computer Science co-hosted this years FIRST, or For Inspiration and Recognition of Science and Technology, regional event. This annual contest brings together students, mentors, teachers and parents to collaborate and share challenges after six weeks of designing and building a robot. The Florida regional event is part of a nationwide contest that teams mentors and young people together to solve an engineering design problem in a competitive way. The national competition will involve more than 30,000 high school students on more than 1,130 teams this year. This years game, called Rack and Roll, featured students designing and building robots that placed inflatable tubes on a threelevel rack in the center of the playing field. Midway through the first days competition, a select number of students served as hosts for sponsors attending an invitationonly luncheon featuring Kennedy Space Center Director Bill Parsons as guest speaker. The new Vision for Space Exploration was rolled out in 2004 and that takes us back to the moon and on to Mars, Parsons said. Although NASA has been involved in a lot of space operations since the Apollo era, we have not designed a new space vehicle in quite a while, so this will be a new endeavor for us and we need students like you to help us. We need you to get involved with engineering, get involved in science and get as much hands-on experience as you possibly can. Other major sponsors involved in the Florida regional event include ASRC Aerospace, Boeing, Lockheed Martin and United Space Alliance. More than 70 scholarship opportunities worth close to $8 million are available to students participating in this years FIRST events. The FIRST Championship will take place at Atlantas Georgia Dome on April 12-14. Visit www.usfirst.org for information. COMPETING ROBOTS try to loop the large metal target with colored rings. The robots are products of student teams taking part in the FIRST robotics event held at the University of Central Florida Arena March 8-10. CENTER DIRECTOR Bill Parsons (center) dons the pink wig that represents team No. 233, composed of students from Rockledge, Cocoa Beach and Viera High Schools. The team is cosponsored by NASA KSC. THE FIRST, or For Inspiration and Recognition of Science and Technology, Robotics Competition challenges teams of young people and their mentors to solve a common problem in a six-week timeframe using a standard kit of parts and a common set of rules. STUDENT TEAMS representing Florida and several out-of-state areas display and work on their robots in the pit area for the FIRST robotics event. NASA and the University of Central Florida are cohosts of this years Florida regional contest. Several Kennedy Space Center employees serve as mentors, judges and referees at the annual event. SPACEPORT NEWS March 23, 2007 Page 7 Remembering Our Heritage By Kay Grinter Reference Librarian D eveloping the budget to build a moonport was almost as challenging as building the space center itself. NASA was already partnered with the U.S. Army Corps of Engineers in 1961 when NASA announced that 80,000 acres of land on Cape Canaveral and the surrounding area would be purchased to support manned lunar flight and missions requiring advanced Saturn and Nova boosters. NASA requested that the Corps act as the real estate agent for the acquisition, and later perform design and construction services for the facilities. The budget process was complicated in 1962 for Rocco Petrone, chief of the Heavy Vehicle Systems Office for the Launch Operations Center. His team had to plan and budget for new facilities and equipment for an undefined launch vehicle to meet the deadline set before the decades end. Budget figures had previously been in the millions of dollars; expenditures in the hundreds of millions now had to be justified. After Congress passed an appropriation act, the Bureau of the Budget released apportioned money to NASA periodically45 years ago: How much does it cost to build a moonport? NASA number crunchers askaccording to phases of development. NASA Headquarters then transferred money to the center at intervals for each project. All of the funds appropriated for a project for a specific fiscal year were rarely released during that year. NASA alumnus Libba Johnson was a program budget analyst in financial management in 1962 and deputy of resources management when she retired in 1992. After we got a lump sum from NASA Headquarters, she said, we parceled it out to various contractors. Under contract to NASA, the Corps was allowed to recover administrative fees by agreement. The orange groves were also leased back to the original owners through the Corps, Johnson recalled. The construction funding spoon-fed to the center peaked in 1963 at $204.3 million, with only slightly lower amounts transferred over the next three years. Hal Row was a structural engineer who joined the Corps in 1962. We took NASAs requirements and turned them into design requirements, recalled Row, now a consultant at the Kennedy Space Center Visitor Complex. Everything was being done for the first time. We had no ideaEARLY DEVELOPMENT at the center included extending the railroad past the Central Supply Warehouse (above) and completion of the Operations and Checkout Building (below). National Space Club honors Melnick with Debus Award how dramatic the outcome would be. Row thrived on the challenge and left the Corps in 1967 to work for NASA. In retrospect, how much does it cost to build a moonport? By the time 1968 drew to a close, $917.9 million had been spent on construction of facilities at Kennedy Space Center.BRUCE MELNICK will be honored with the 2007 Debus Award for his contributions to Americas space program. The event will be held April 28 at the Kennedy Space Center Visitor Complexs Debus Center. T he National Space Club Florida Committee invites the spaceport to honor Bruce Melnick, former NASA astronaut and current vice president of Boeing Florida Operations, as the winner of the 2007 Debus Award for outstanding contributions to Americas space program. The Debus Dinner will be held April 28 at the Kennedy Space Center Visitor Complexs Debus Center. The reception begins at 6:30 p.m., followed by dinner at 7:30 p.m. Individual tickets are $75 for members and $85 for non-members. Corporate tables, with seating for 10, are available for $800. Space is limited at the black-tieoptional event. Contact LaDonna Neterer at 321-505-2037 or ladonna.j.neterer@boeing.com for reservations. 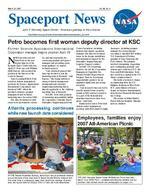 Page 8 SPACEPORT NEWS March 23, 2007 John F. Kennedy Space Center Managing editor. . . . . . . . . . . . . . . . . . . William Johnson Editor. . . . . . . . . . . . . . . . . . . . . . . . .Jeff Stuckey Copy editor . . . . . . . . . . . . . . . . . . . . .Corey Schubert Editorial support provided by InDyne, Inc. Writers Group.NASA at KSC is located on the Internet at http://www.nasa.gov/centers/kennedyUSGPO: 733-049/600129 Spaceport News Spaceport News is an official publication of the Kennedy Space Center and is published on alternate Fridays by External Relations in the interest of KSC civil service and contractor employees. Contributions are welcome and should be submitted two weeks before publication to the Media Services Branch, IDI-011. E-mail submissions can be sent to Jeffery.Stuckey-1@ksc.nasa.gov. Cape Canaveral Lighthouse lantern room restored A s workers wait at the top of the newly repainted Cape Canaveral Lighthouse (left), a crane carefully moves the refurbished 18,000-pound lantern room toward them. The optic, or light, (visible in the center of the tower) was powered down for the restoration and removed for maintenance and overhaul, as well. This rotating beacon  which can be seen up to 22 miles offshore  is operated by the U.S. Coast Guard, while the lighthouse is owned by the U.S. Air Force. The extensive refurbishment project was started a year ago following many years of normal weathering in the coastal location, which was heightened by hurricane damage from the 2004 season. As part of the restoration, the original brass roof of the lantern room was returned to the structure and its familiar blackand-white daymark was repainted. The final step will be the relighting of this active navigational aid, scheduled for sometime in spring. T he 2007 KSC Biannual Diversity Event with guest speaker George Takei will be held in the KSC Training Auditorium at 11:30 a.m. April 9. Takei is best known for his portrayal of Mr. Sulu in the acclaimed television and film series Star Trek. Takei is currently playing the father of time traveler Hiro Nakamura on the NBC TV series Heroes. Takei was born in Los Angeles. During World War II, his family and 120,000 other JapaneseAmericans were placed within barbed-wire enclosures of U.S. internment camps. Takei spent Biannual Diversity Event features Star Trek actor most of his childhood at Camp Rohwer in the swamps of Arkansas and at wind-swept Camp Tule Lake in northern California. His family eventually returned to Los Angeles, where Takei began his acting career. A community activist, Takei serves as chairman of the council of governors of East West Players, the nations foremost Asian Pacific American theatre. He is chairman emeritus of the board of trustees of the Japanese American National Museum and a past member of the advisory committee of the California Civil Liberties Public Education Program. He is also a member of the Human Rights Campaign. Seating allocations for this presentation will be provided to directorates and contractors. The program will also air on NASA TV for those unable to attend. No flash photography or individual videography will be allowed during the presentation. For those present in the auditorium, there will be an opportunity for questions following the formal presentation.GEORGE TAKEI will appear at the Training Auditorium on April 9. Spaceport employees receive 15-percent discount for Camp KSC spring session C amp Kennedy Space Centers spring session for children entering second though ninth grade is scheduled for March 26-30. Regular tuition is $295 per child. There is a 15-percent discount for badged employees and contractors of Kennedy Space Center, Cape Canaveral Air Force Station, Patrick Air Force Base and retired KSC personnel. Spring camp hours are from 9 a.m. to 4:30 p.m., with extended drop-off and late pick-up hours available free for badged employees. Call 321-449-4444 for details.